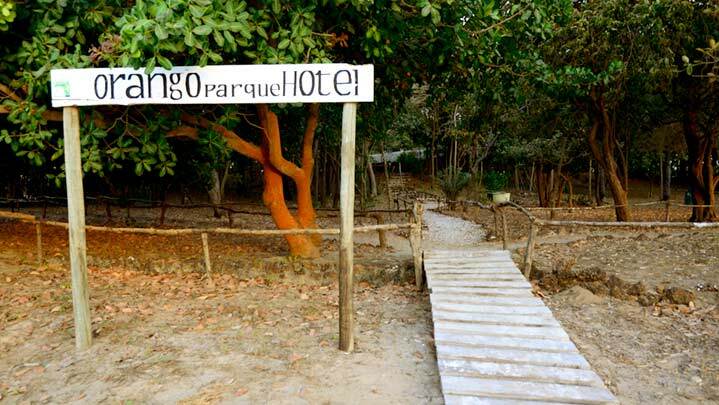 Orango Parque Hotel is situated in Ponta Anabaca, on the Orango Grande Island, within the Orango National Park. 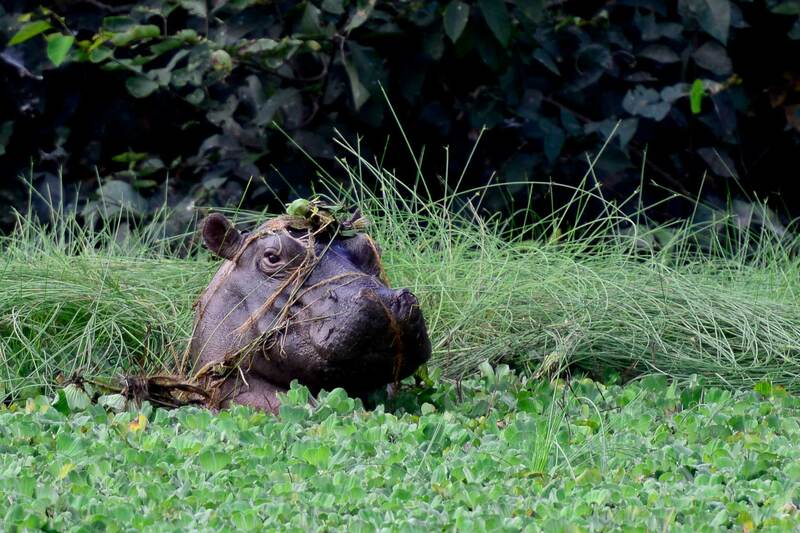 It is a place where you can experience conservation and sustainability values everywhere. 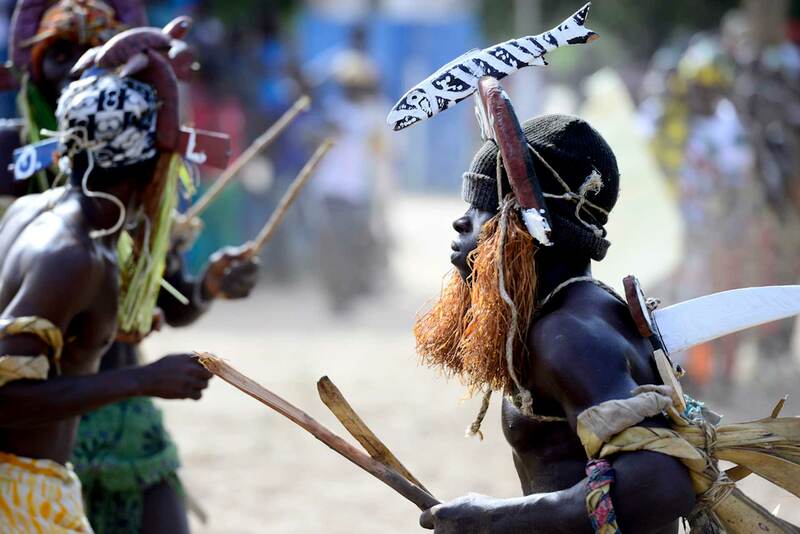 You will find here biodiversity and cultural tradition come together in one unique place. 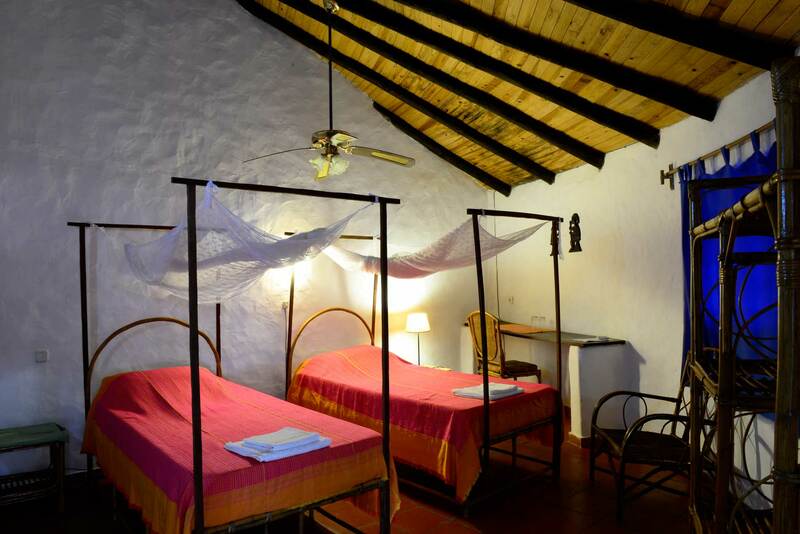 Orango Parque Hotel is not just a tourist establishment. 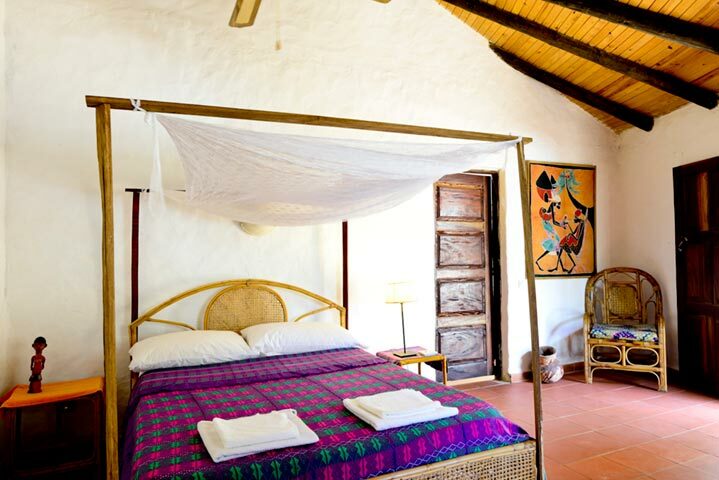 The hotel is managed by the Associaçao Guiné Bissau Orango, a non-profit organisation that takes part in the development of ecotourism in the country’s National Parks. 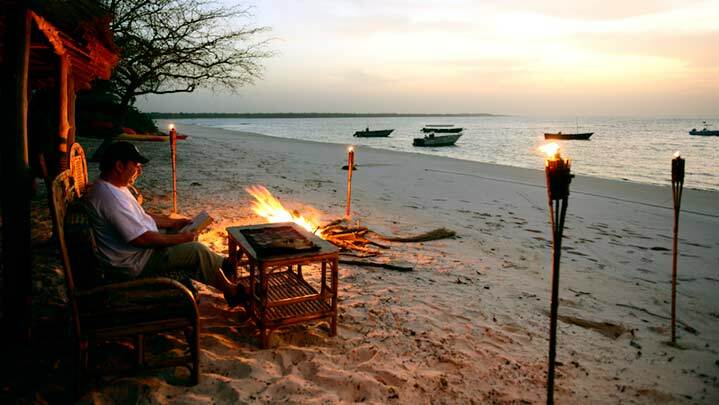 A commitment to responsible and sustainable tourism enabling tourism to be compatible with the conservation of biodiversity. 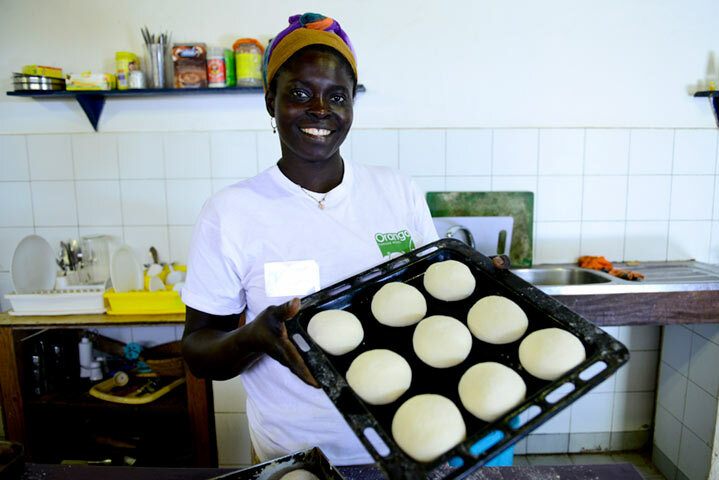 Its main partners are the CBD-Habitat Foundation, a non-profit foundation dedicated to developing projects related to the conservation of biodiversity and its habitat, while also facilitating relationships between man and his natural surroundings; the Institute for Biodiversity and Protected Areas of Guinea Bissau Institute (IBAP); and the International Union for Conservation of Nature (IUCN). 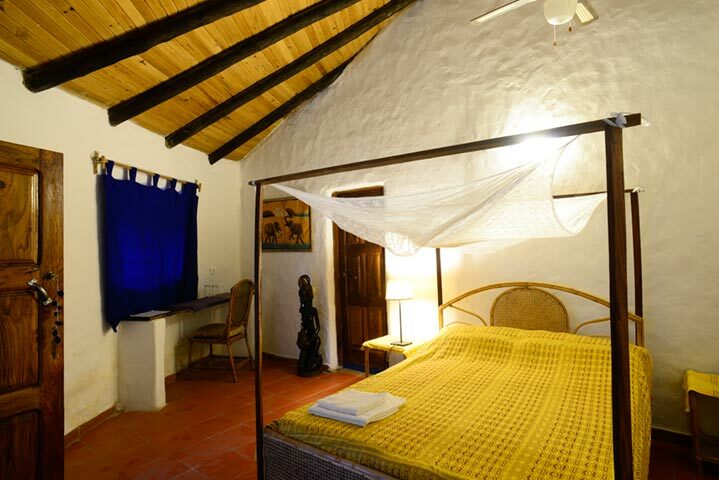 The Orango Parque Hotel is an ecotourism enclave made up of fully equipped bungalows offering a high level of comfort. The buildings respect the local architecture and the environment, blending perfectly into the surroundings. 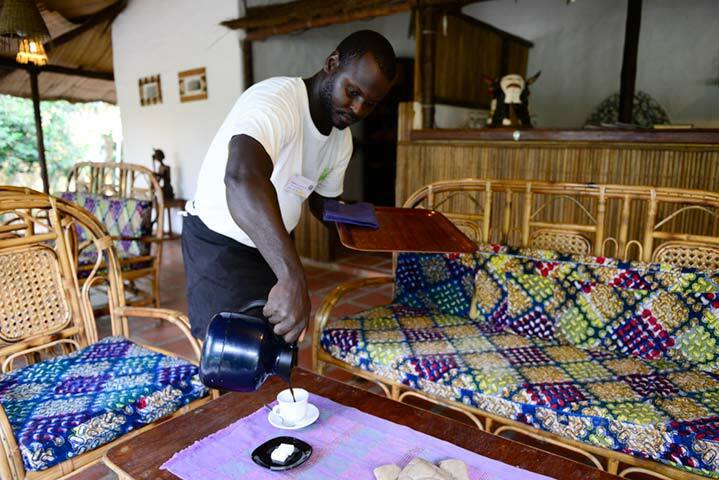 Its small capacity -20 people- ensures guests an exclusive and personalized service. 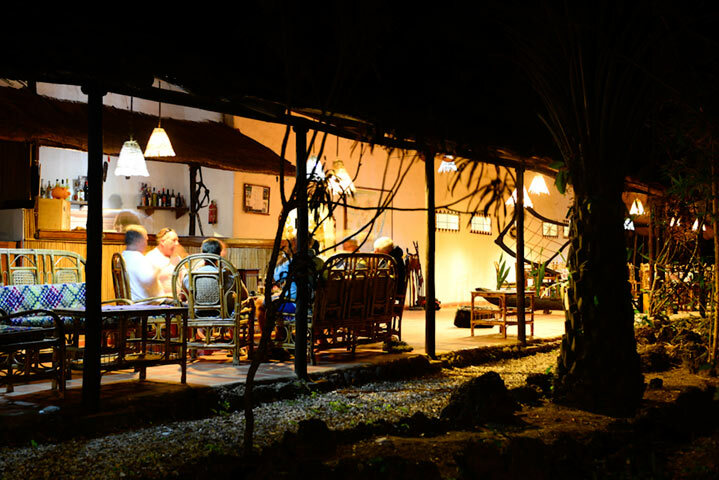 The hotel has a restaurant, a bar, a reception area, a museum dedicated to Bijagó culture and a small souvenir boutique that also sells local arts and crafts. 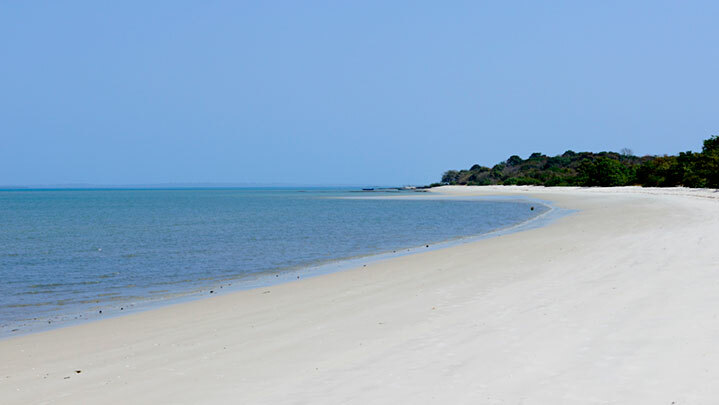 All this right by the sea, with a direct access to a large white and fine sandy beach where you can enjoy the sea and the beach. An ideal place for your unique experiences. 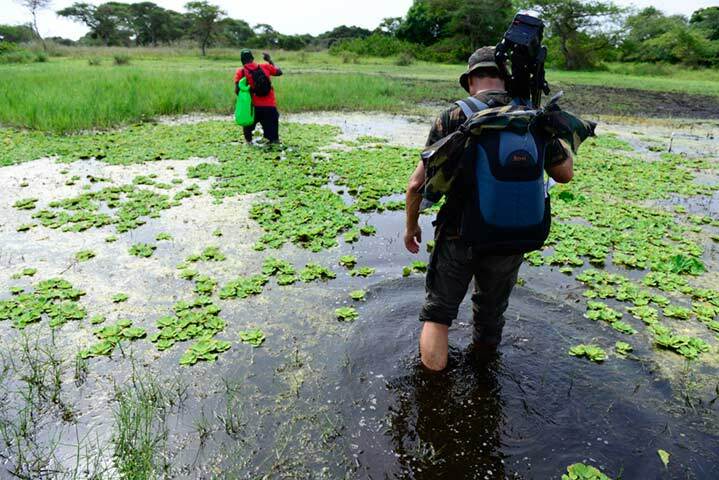 you will be helping to improve the life quality of the Orango National Park population and to conserve its extraordinary natural and cultural diversity. 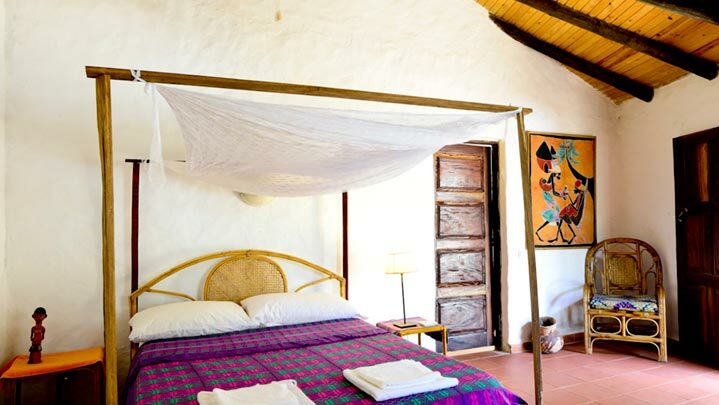 Perfectly integrated into its surroundings, Orango Parque Hotel has 3 African-style bungalows, two of which have 8 double rooms and the third one has a suite with 2 bedrooms and a shared bathroom. 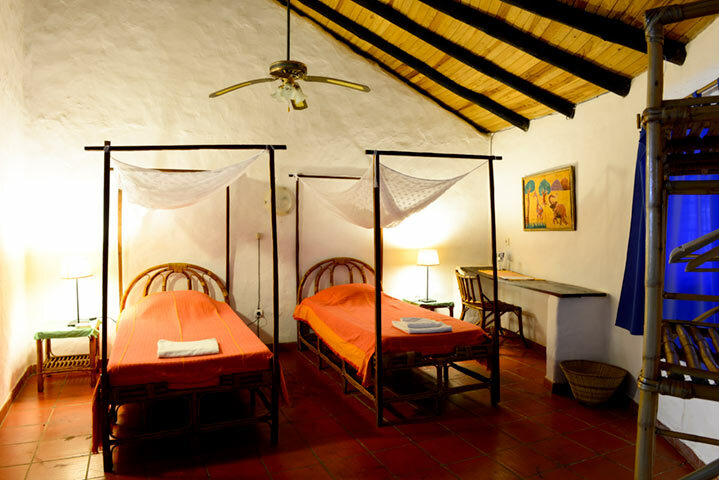 The hotel rooms have been built respecting the local architecture and the environment and they are decorated in a simple, traditional style. 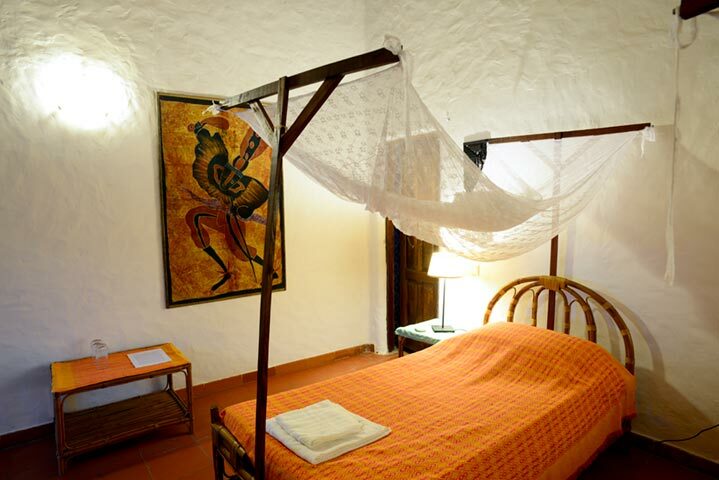 A private bathroom with shower and a bed with a mosquito net will make your stay more pleasant. 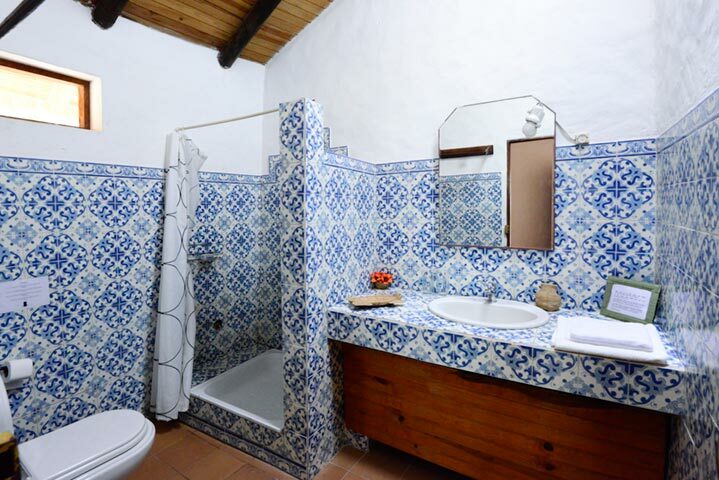 The suite comprises two large bedrooms with a shared bathroom and a capacity for 4 people, perfect if you are travelling with friends or for a family. 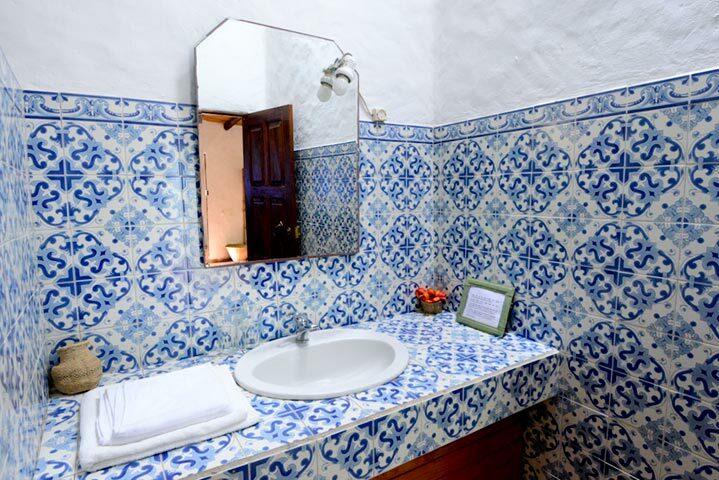 A friendly and personalized service is guaranteed due to its capacity for only 20 people. 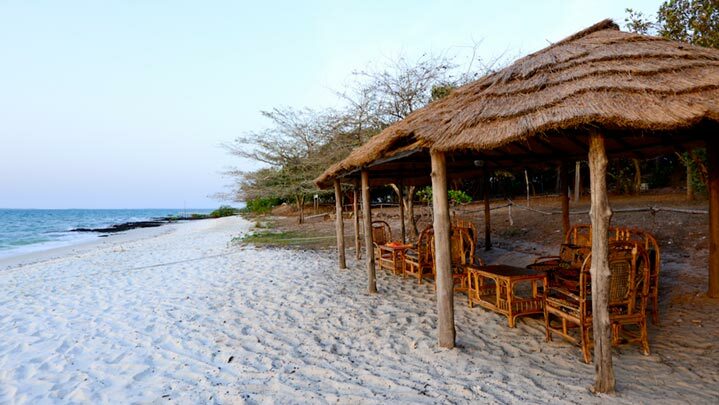 During your stay at Orango Parque Hotel you can watch the sun go down by the sea under the beach shelters, chill in our bar area or enjoy a refreshing drink. 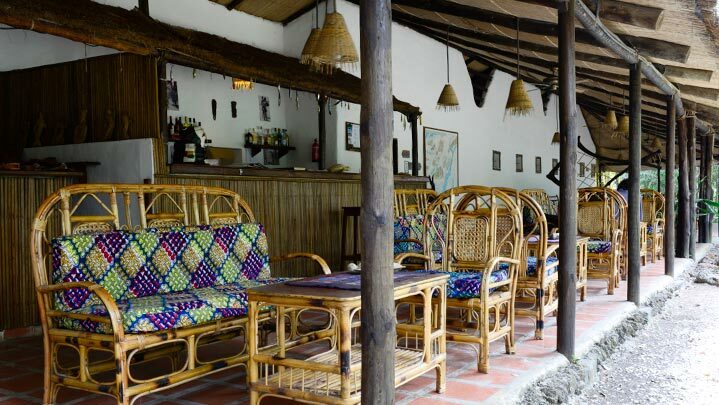 Clients and tourists can enjoy a friendly ambience in the open air bar. It offers a wide range of national and imported drinks (wines, whiskies, gins…), local beer and caipirinhas. 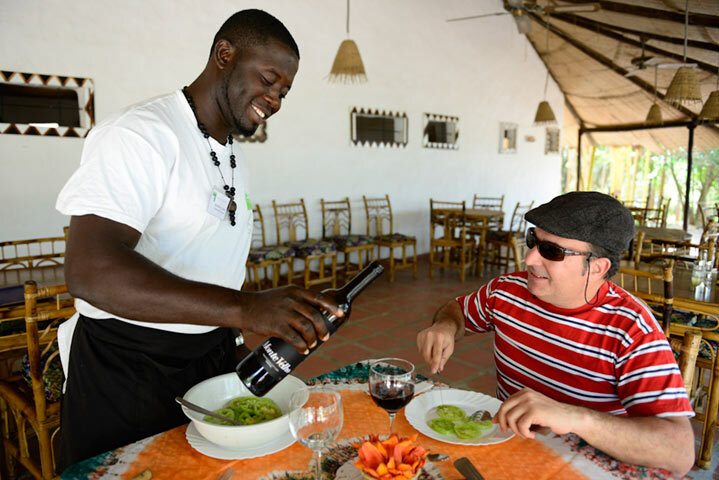 The waiters will be delighted to provide quality customer service in a friendly and pleasant manner. 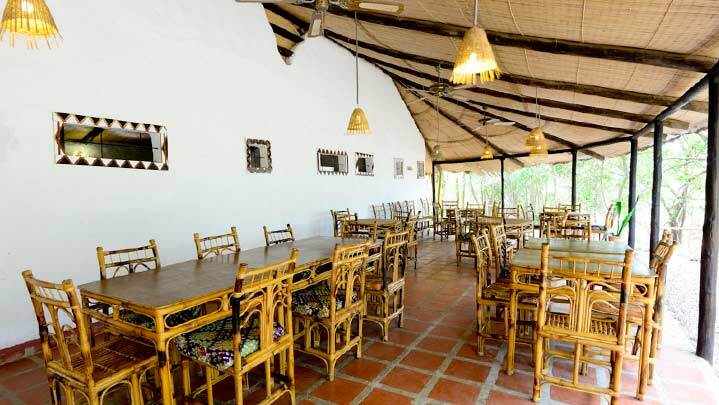 The restaurant / dining area is located in the central bungalow. The hotel offers its guests full board. The hotel’s philosophy and the unique location mean the chef and his team prepare succulent menus every day with fresh fish and other products caught straight from the sea, accompanied by seasonal fruit. The menu includes typical products of the Bijagó Islands, such as combe, a type of local cockles, fish and Bijagó rice. 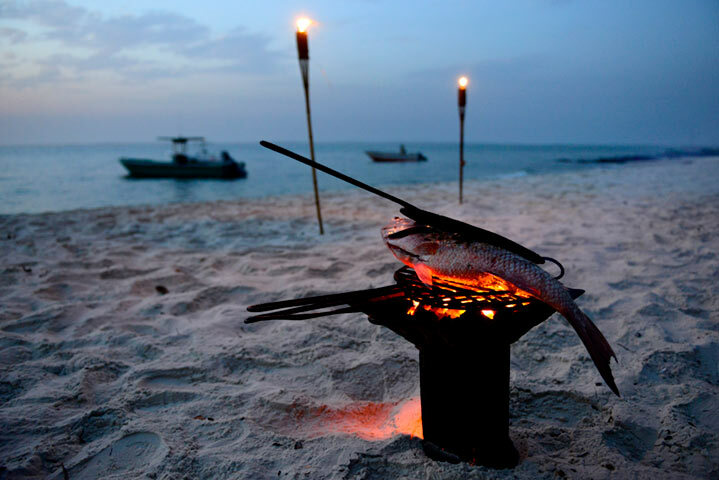 The fresh fish can be served grilled, baked, en papillote, marinated or as fish carpaccio or delicious fish skewers, all served with “tarrafe”, a delicious prawn and cockle sauce. You can also try the delicious mangrove oysters. Palm oil is often used in Bijagó cuisine; however, given the particular flavour of this oil it is not used in the Orango Parque Hotel, as it is generally not a flavour enjoyed by tourists. 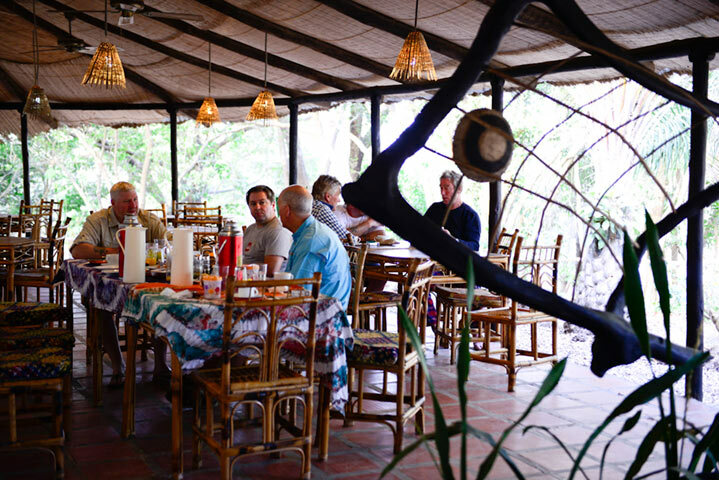 We suggest that our most daring guests should try the Bijagó cuisine as a way of experiencing local cultures and traditions. An experience for the most exotic palates. 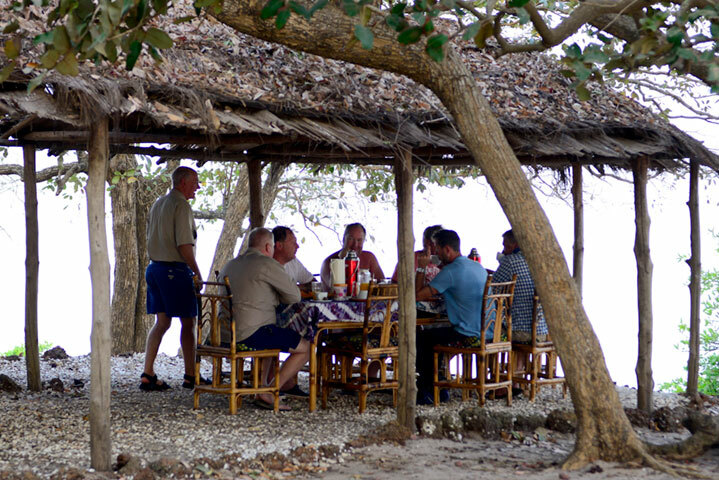 Tourists that are simply passing by the Orango Island can also enjoy our daily menu. The Orango Parque Hotel has 3 boats (Piskavalho, Kavens and Entanke) all of which are used to transport visitors. Piskavalho and Kavens with a maximum seating capacity of 7 passengers and Entanke with room for 14 passengers. All the boats are built and insured in France. Hulls are made of aluminium and they are unsinkable. The boats are equipped with a main outboard motor, a safety outboard motor, lifejackets, raincoats, radio, GPS and a first aid kit. 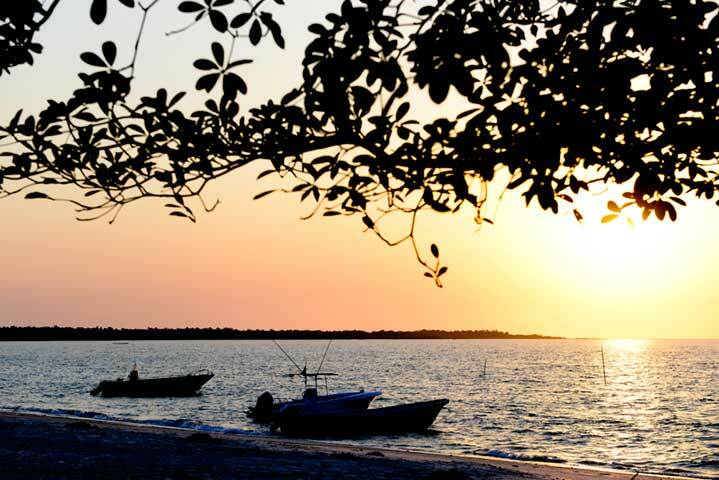 The boats are available to transfer clients, for excursions, for no-kill sport fishing activities and they are also used as a backup for the Eticoga health centre for transferring patients. 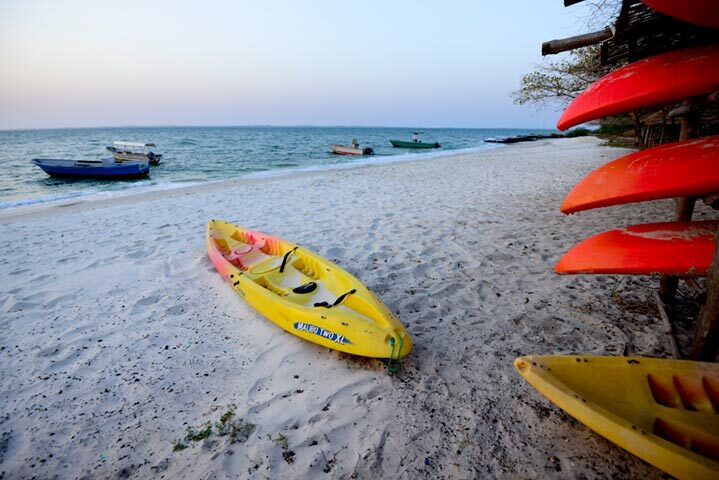 On calm days clients and tourists can use the Orango Parque Hotel’s kayaks for outings and excursions from the beach. 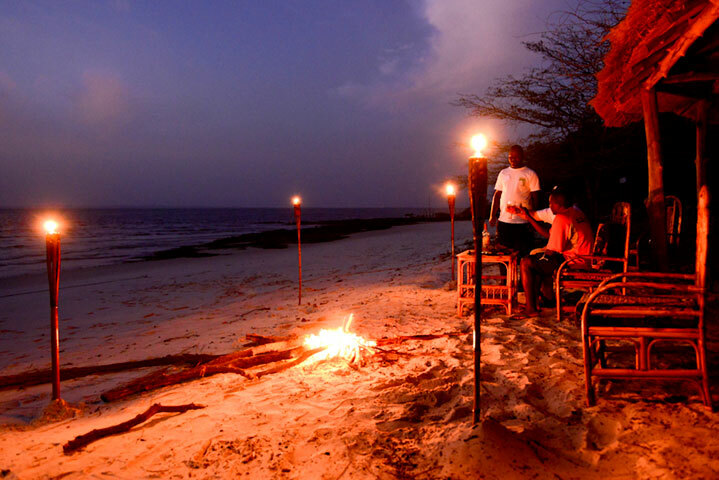 A fun activity, respectful with the environment that enables you to enjoy nature and the sea in an unique place. 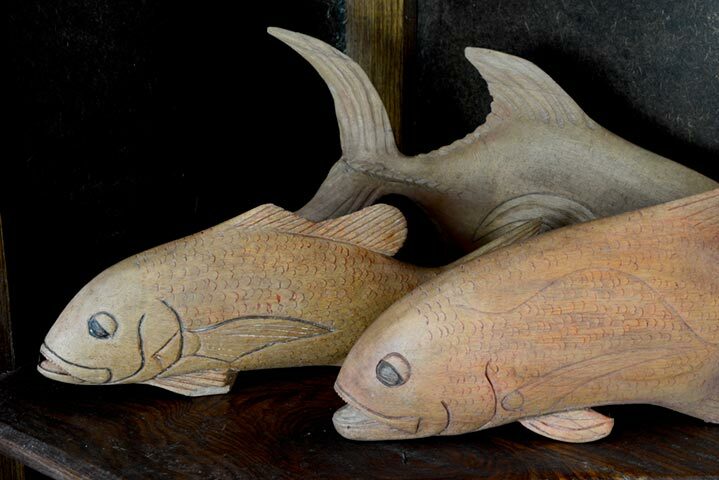 You can take home a piece of the Bijagós Islands with you. 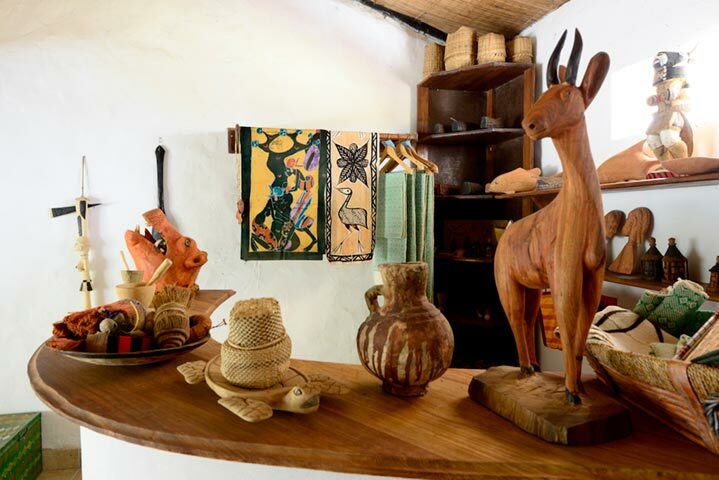 Local artisans of Orango National Park design and make traditional Bijagó handicrafts using indigenous materials, respecting and preserving the local customs and traditions. 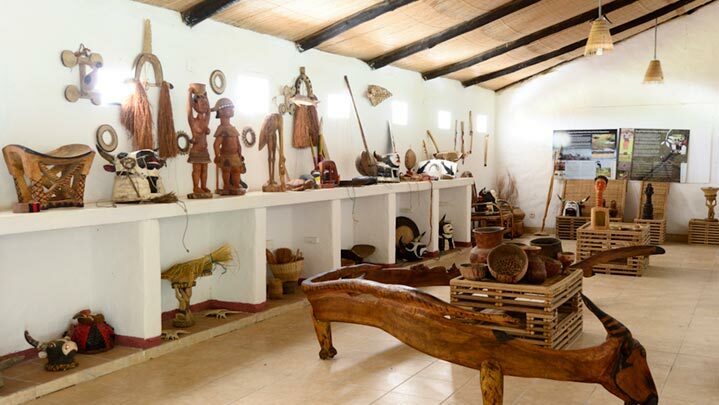 The Orango Parque Hotel houses the National Park’s most comprehensive exhibition on the Bijagó culture : The Bijagó Community Traditions and Culture Museum. 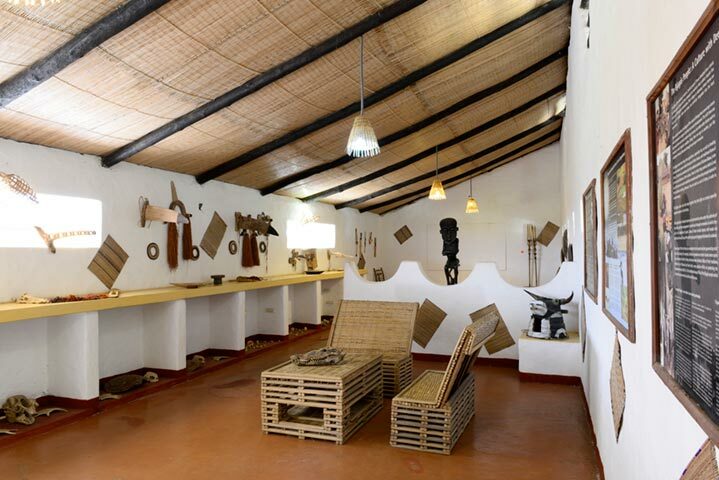 The museum has a small sample of ethnographic arts and crafts with traditional masks and typical Bijagó costumes. 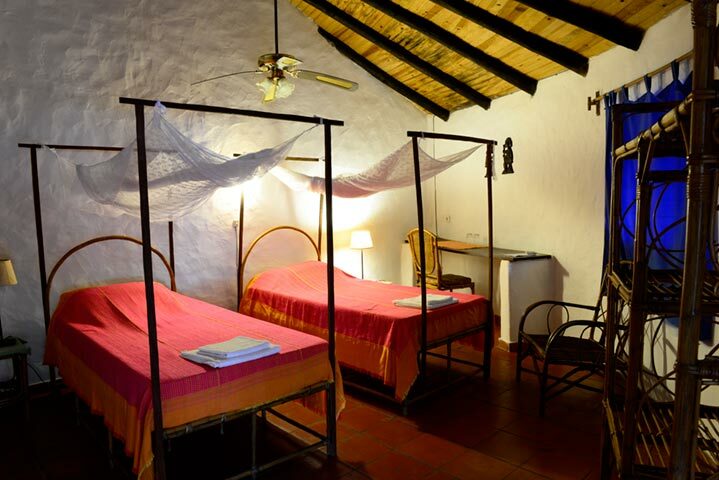 Orango Parque Hotel has Spanish, English and Portuguese speaking guides available, with prior reservation. Outside there is a large map of the area that welcomes visitors and allows them to establish their route before heading off. 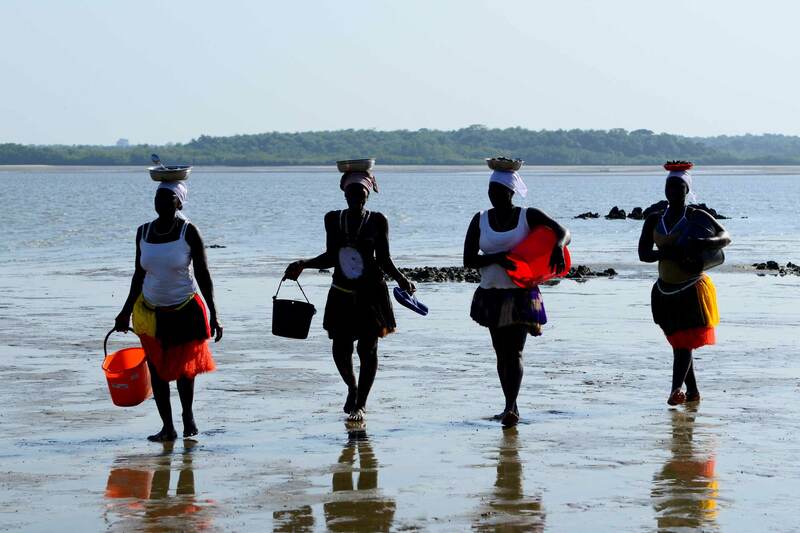 A visit to Eticoga, an excursion to Uno Island, shell-fishing activities with the Bijagó women, an exhibition of traditional dances are some of the activities and excursions available for tourists and clients of the Orango Parque Hotel. Check the programmed tours. 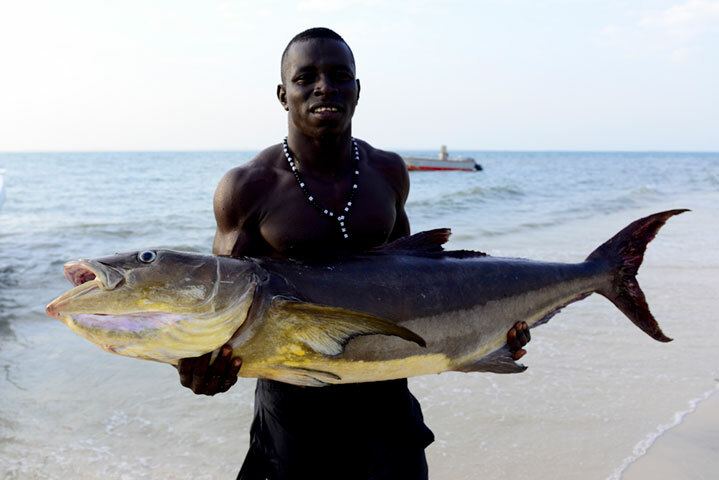 Those that enjoy Spinning, Popper and Jigging, will be in fishing heaven in Guinea Bissau. Fishing in the interior waters of the archipelago is simply amazing, where nutrient-rich waters are home to a large variety of species: Giant tarpons, a number of large Shark species, Carangidae, Sea Bass, Red Snapper, different species of manta rays, Barracudas, Cobias and lots of different species of large fish that are hard to catch in other areas. Please ask for more information about sport fishing activities and programmes. Orango Parque Hotel has a transfer service to and from the Osvaldo Vieira international airport, with prior reservation. 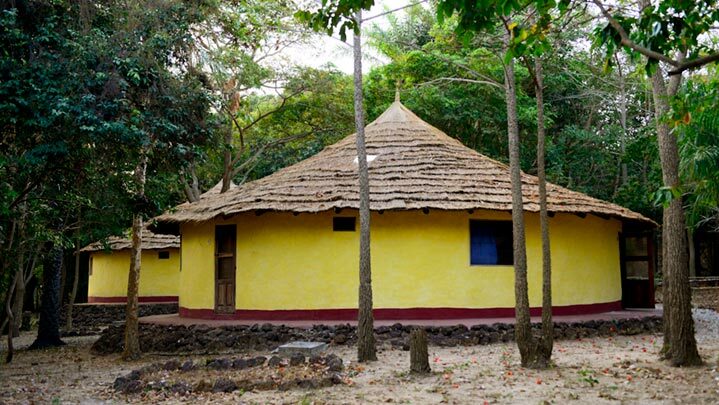 It’s the ideal place to live together with the local community, to know their culture and to get closer to their customs; a tool for nature conservation and local development under sustainability parameters. Meeting point for nature and tradition.